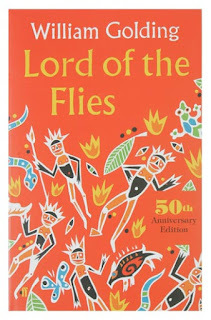 This is the book I'm currently studying (in Year 11) for my English Literature GCSE. I wasn't expecting much from this book after reading last year's book To Kill A Mockingbird and not enjoying it because I assumed it was just that I didn't enjoy books I had to read rather than had chosen to. This book proved that wasn't the case. Because we are studying this in school, a lot of it was read during lesson time by classmates and my teachers. I found that because we were encouraged to talk about the events of the chapter immediately after reading it, the novel became even more interesting. There were many examples of symbolism that were pointed out by my classmates and my teacher that I may not have picked up on if I'd read it myself. The story follows a group of boys who are stranded on a desert island after a plane crash. All of these boys are under 12 years old. As the novel progresses we learn how they chose to deal with their situation and the community they develop. I can definitely see why this is the novel is chosen to be the novel studied in Year 11 GCSE English Literature. I felt like I learned a lot from reading this novel, not only as a reader but also as a writer. The way William Golding uses symbolism is both beautiful and intelligent and I found it really interesting to try and decipher what was symbolism and what wasn't. I would definitely recommend this book as I personally found it a really enjoyable read!